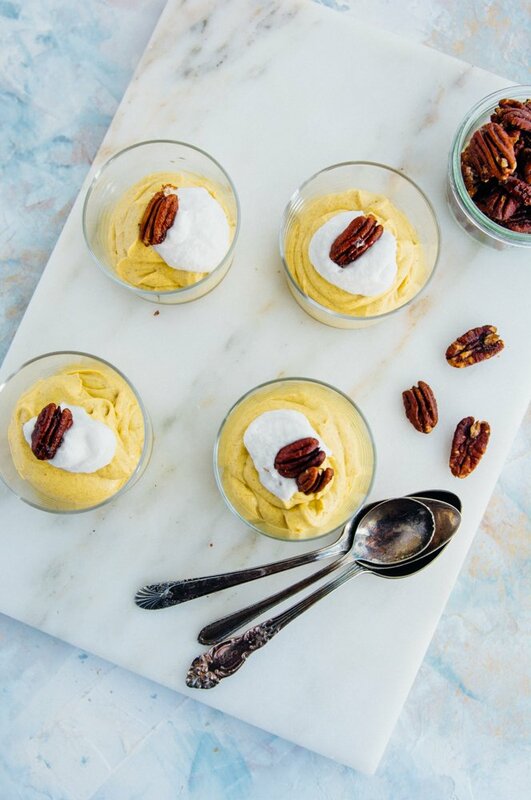 Looking for a last minute dessert for your holiday table? 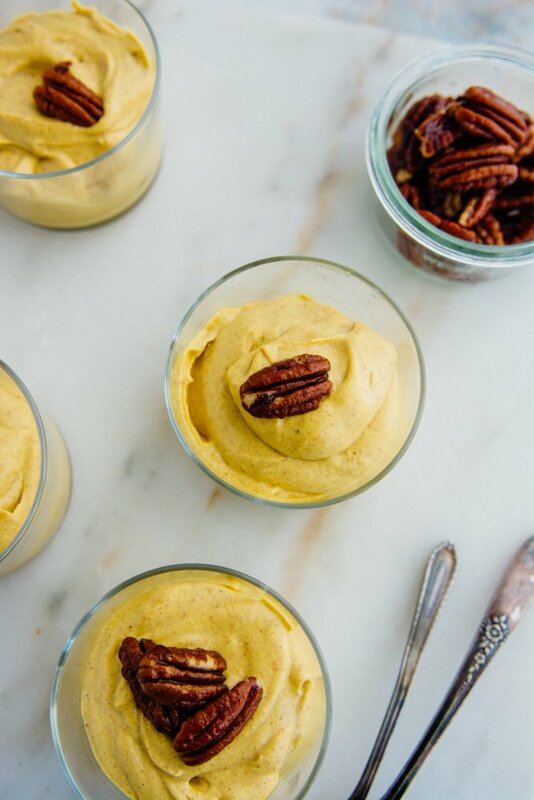 This quick and easy pumpkin cashew pudding takes just a few minutes to prepare and is perfect for making ahead of time. You can soak the cashews the night before or just cover them with boiling water and let them soak for an hour. To be absolutely honest I’ve been eating it for breakfast the last few days and it keeps me satisfied and happy until lunch. The base is soaked cashews and pumpkin puree and then I added some dates and maple syrup for sweetness. A touch of lemon juice for complexity and some warming spices to round it all out and you’ve got a healthyish and tasty dessert. 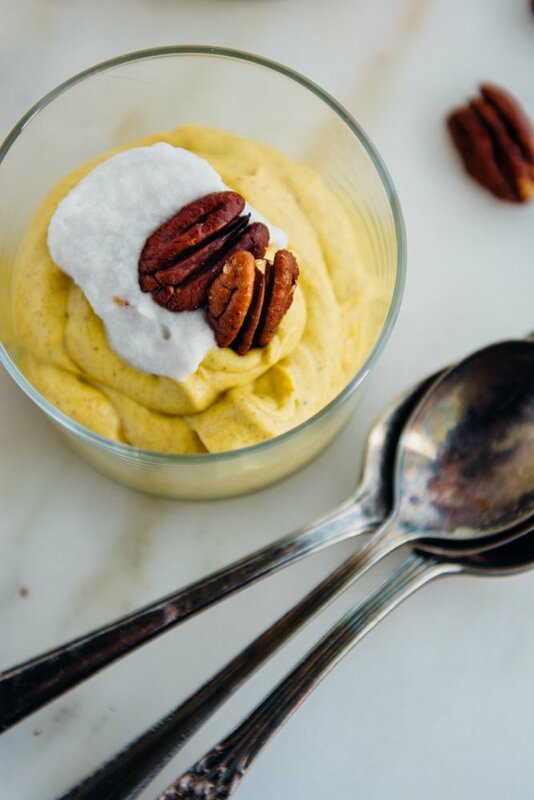 Be sure to use canned pumpkin puree and not pumpkin pie mix since it has added sugar and will be overly sweet if you use it! Whether you decide to make it for the holiday or just to satisfy your sweet tooth, I hope you enjoy it as much as I do! 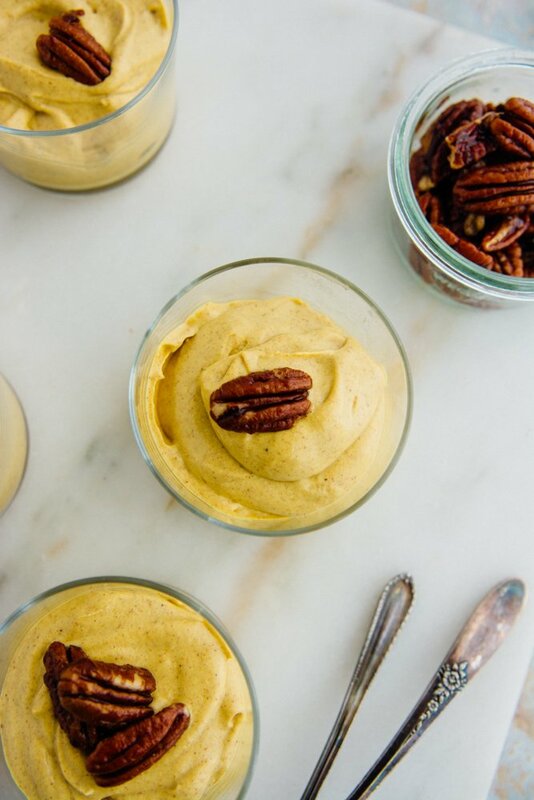 Serve this to your guests this Thanksgiving and they won’t even notice that it’s Vegan. As a matter of fact, I wouldn’t even mention it. Have a wonderful holiday, may it be filled with good food, good friends, and great memories. P.S. If you make this recipe, I’d love to hear what you think. Leave a comment, rate it, and don’t forget to tag a picture #scalingback on Instagram so I can see what you came up with! Cover the cashews with water and let sit for at least 4 hours or up to overnight. If you are in a hurry cover with boiling water and they will be ready to use in one hour. Pre-heat the oven to 350 degrees and line a baking sheet with parchment paper. 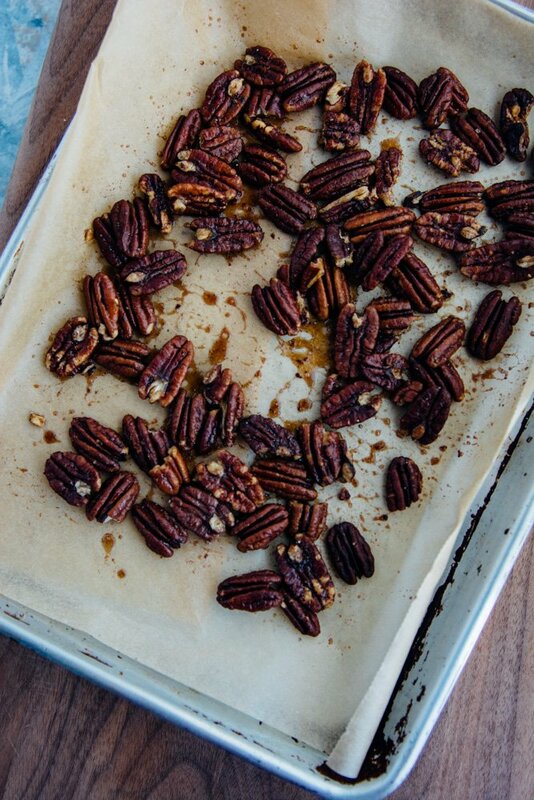 Spread the pecans out into an even layer and toast for 5 minutes. 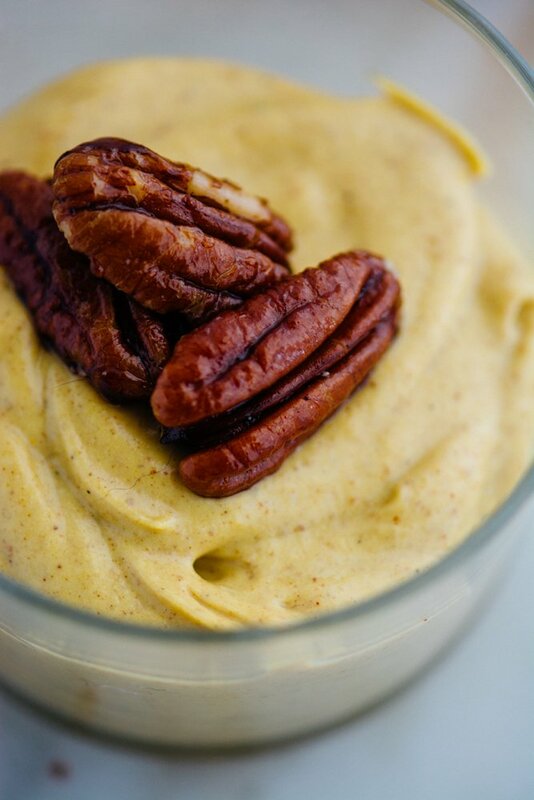 While the pecans are in the oven combine the maple syrup, olive oil, cinnamon, cayenne pepper, cardamom, and salt in a small bowl and stir well to combine. Remove the nuts from the oven, pour the maple syrup mixture over the top and mix well making sure to coat all the nuts. Return the tray to the oven and cook for another 3-4 minutes until fragrant and golden brown, being careful not to burn the nuts. Add all the ingredients to a high-speed blender or food processor and blend on high for 2-3 minutes until the mixture is smooth and creamy. Taste and adjust adding a bit more sweetener if you'd like or an extra squeeze of lemon juice to brighten things up. Let the pudding chill for an hour to develop the flavors and set up a bit. 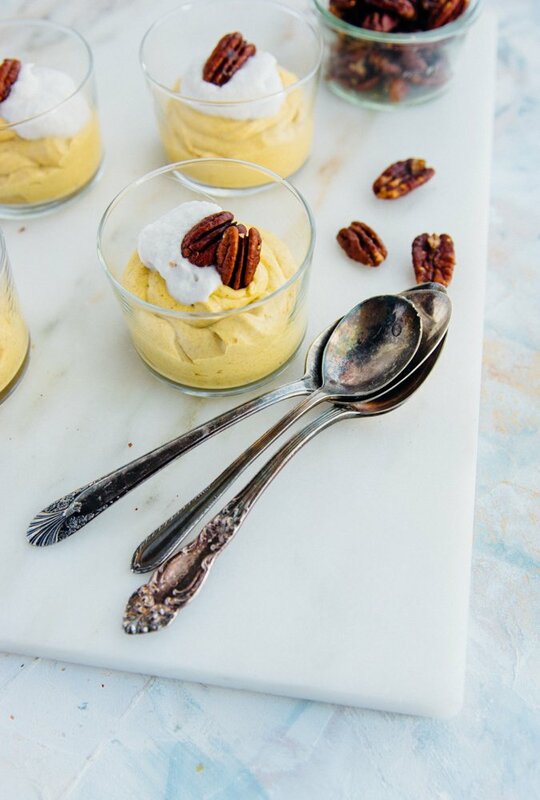 To serve, scoop ¼ of the pudding into a small bowl, top with some whipped coconut cream and sprinkle with a few of the pecans.